Jonathan Pierce, owner and operator of JP's Surf Camp, has over 25 years surfing experience, and is CPR / First Aid certified. 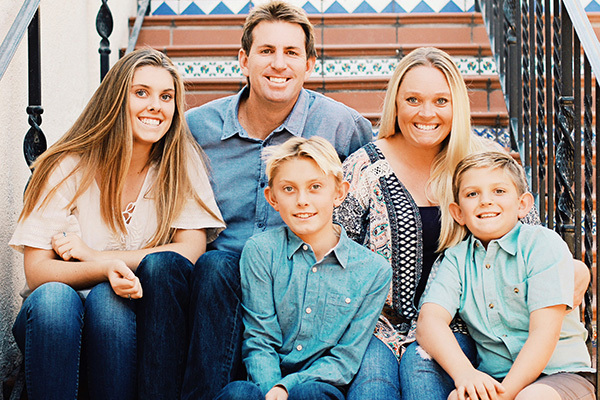 Jonathan is a teacher with the Capistrano Unified School District and has a Masters Degree in Education. Jonathan is married to his wonderful wife Michele and they have three children; Hannah, Nathaniel, and Matthew. Jonathan has a strong passion for the sport of surfing and a love for the ocean. Jonathan states "It is a pure privilege and joy to watch a child surf for the first time and become involved in the wonderful sport of surfing. They will hopefully grow up to love and respect the ocean as much as I have." All of our instructors are First Aid trained, CPR certified, experienced with the ocean, and are wonderful instructors who love the ocean and enjoy teaching the sport of surfing.